Do you remember the TV mini-series Roots? It was based on a book of the same name where the author, Alex Haley, set out years to discover his family’s history. After a strenuous search that led him back to the African continent, he pieced together clues and bits of information regarding his family history. One day as he sat for hours listening to a tribal story-teller giving an account of his tribe, the clues all fell in place. “So-and-so married so-and-so. They had a son. In such-and-such a year he was taken away and never seen again.” What was the name of the son? Kunta Kinte. The year was 1752. Alex Haley said, “I had what they call a peak experience.” It was one of those moments of revelation that you have once or twice in a lifetime. He said, “I realised then that I had roots. I had history. My family came from somewhere.” Today as we heard the narration of Jesus’ genealogy, his family history, I hope many of you too had a similar peak experience. Jesus, the Son of God, the Word made Flesh, had roots. He had a history. And that history is ours too. The liturgy and the readings of this Vigil Mass for Christmas seek to situate the birth of Christ in the history of the Chosen People of God. St Matthew wrote his Gospel in large part for the Jews to prove that Jesus was the long-awaited Messiah who fulfilled all of the Old Testament promises. Therefore, he begins his gospel by stating that Jesus was the fulfillment of God’s covenant to David, which promised that the Messiah would be a king who ruled over an everlasting kingdom, and the fulfillment of God’s covenant to Abraham, which promised that all people would be blessed because of the Messiah. But as Alex Haley will tell you, dig deep enough into your family history and you would soon discover as many scoundrels as you have heroes among your illustrious or infamous ancestors. Most of us would have a knotted past. And so when we begin to study the names found in the Genealogy of Jesus in detail, it’s almost as if God has pulled together a rogue’s gallery. We may not know many that are on the list. But of the ones we know about, nearly all of them had notable moral failures on their spiritual resumes. For instance, Abraham lied about his wife Sarah. Isaac did the same thing. Jacob was a cheater, Judah a fornicator. David was an adulterer and Solomon was a polygamist. Manasseh was the most evil king Israel ever had. And on and on we could go. This is not a list of role models or saints. Far from it. Some weren’t saints at all. The best of these men had flaws and some were so flawed that it would have been best to expunge their names from the records of history. But Matthew’s genealogy of Jesus didn’t. If you think the men were bad, wait till you hear about the women, four are named in this list. Matthew’s choice is perplexing. He could have chosen paragons of virtue but instead he chose the most scandalous of female ancestors, the ones whom you try to hide in the closet and blush whenever their names are mentioned. To add to the perplexity, it is also interesting to note that when the Jews made a genealogy they normally didn’t include women on the list. These four women were each notorious in their own right. Each had a charge sheet that would make Bonnie and Clyde look like angels. These are serious knots in the line that leads to Jesus Christ! Yes, Jesus, the Son of Abraham and the Son of David, is also the descendant (by adoption, at least) of a whole line of notorious sinners. What would this serve to prove? I think there are three answers to this question. First, no one is condemned by a sordid past. All of us have a history, we have our respective baggage, skeletons in the closet, our past records of failures and a heap full of mistakes, yet through the mercy of God, these things do not condemn us a lifetime of the same messiness. Yes, we have a history, but we also have a present and a future. The coming of the Incarnate Word, was so to divinise us – in the words of St Augustine and other fathers of the Church, “God became man, so that men may become gods. Second, the story points at the insurmountable splendour of grace. We may often be tempted by hubris to believe that we can accomplish things through our own efforts without external assistance, with even a certain autonomy from God. 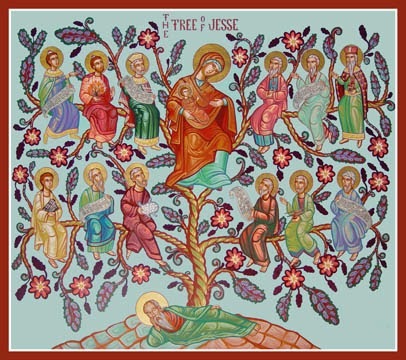 The story of Christ’s genealogy points to the providence of Grace. It is only by grace that a prostitute, an adulterer, a murderer, a fornicator, an incestuous daughter in law can become the carrier and medium of such saving grace. When you read the stories of these four women—and of the men on the list— St Matthew had not intended you to focus on their sin, but on the grace of God. The hero of this story is God. His grace shines through the blackest of human sin as he chooses flawed men and women and places them in Jesus’ family tree. Third, the Genealogy points to the mission of Christ. The Son of man has come to seek and to save that which is lost. He began this mission by situating himself at the very centre of the history of those who were lost and who required redemption. He weaved his own history into the history of sinners in order that he may redeem that history and chart a course for a glorious future. Many of us are quick to boast of the heroes in our family tree, if there were any. But more often than not, we are often weighed down by the baggage of the past. The sometimes devastating impact of the past has wounded many of us psychologically and emotionally, and continues to colour our present lives not only with disturbing memories but also replays itself through recurring destructive patterns. Yet, the path of salvation is not to push the past aside, to suppress and bury it beneath our consciousness. Like the bitter old miser, Ebenezer Scrooge, in Dickens’ novella, the Christmas Carol, who was converted into a kinder and more benevolent man, we need to revisit the ghosts of our past and come to recognise that Christ, the central figure in all history, has come to lead us into the future of reconciliation and redemption. No one is condemned by his past. Christ has come to seek and to save that which is lost. Christ has come to make all things anew! A Merry Christmas! A Blessed Christmas to one and all!